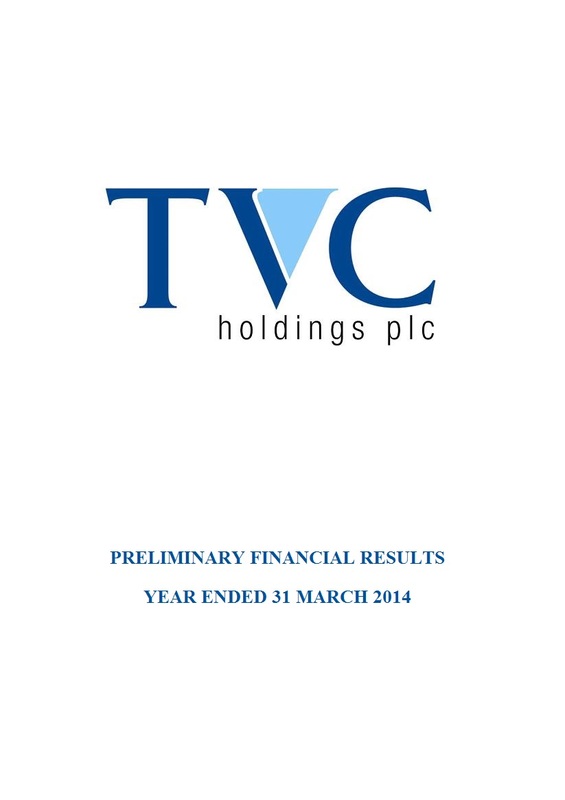 TVC Holdings plc (“TVC”) is an unquoted investment holding company. In May 2014, TVC announced that, following a detailed review of its strategic options, it intended to seek shareholder approval for a package of proposals relating to the reorganisation of the Company’s business, including a significant liquidity event for shareholders and other proposals intended to facilitate the orderly realisation of the Company’s remaining assets, including, in particular, the cancellation of the admission to trading of its ordinary shares on AIM and ESM. Following approval by the Company’s shareholders of all resolutions proposed at the EGM held in June 2014, the Company made a large capital distribution to shareholders in July 2014 through an issue of redeemable shares. Redeemable shares were issued to shareholders, as bonus shares, pro-rata to their holding of ordinary shares and were immediately redeemed for a total redemption payment of €86.8 million. The redemption payment comprised of cash of €63.2 million and UTV shares valued at €23.6 million, based on the valuation of the UTV shares at the redemption date. On 28 July 2014, the Company cancelled the admission to trading of its ordinary shares on AIM and ESM. Going forward, the Company’s activity will be limited to managing the orderly realisation of its remaining assets and liabilities, which is expected to take a number of years. It is expected that TVC will then be wound down with all remaining capital distributed to shareholders.